Connected just above an 8-pin 2903 chip on the underside of the board about 4cm below and 5cm to the left of the corner of the board closest to the external power cable socket. 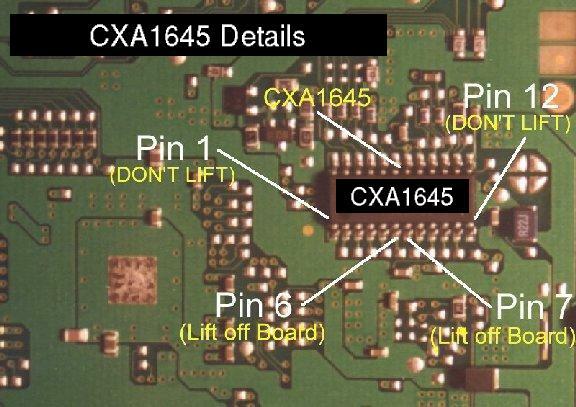 Connect wire #1 to pin #12 of the CXA1645. Connect wire #3 to pin #1 of the CXA1645. Lift pin #6 of the CXA1645 off the PC board or cut the trace coming from that pin. Connect pin #6 to wire #9. Lift pin #7 of the CXA1645 off the PC board or cut the trace coming from that pin. For an NTSC console connect pin #7 to pin #12. For a PAL console connect pin #7 to pin #1.